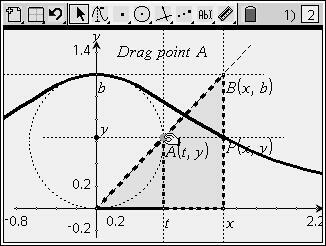 What is the fascination with this famous curve? Can you deduce its construction? Can you find the equation which defines it? Let P be the point (x, y) and the diameter of the circle be a. Let B be the point (t, y) - can you find the other points, and use these to find the function? Use the point B to trace around the circle and so produce the curve. This problem may also be modelled using CabriJr on the TI-83/84 series calculator. Click on the graphic below to download the file and try it yourself! Try having students work in pairs: one generating data points using the CabriJr model and the partner entering these into lists to plot and then to help build their algebraic model! ...And just wait until you try this with TI-nspire CAS!